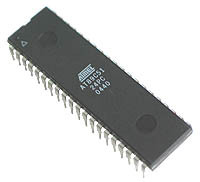 8051 Micro controller is a programmable device which is used for controlling purpose. Basically 8051 controller is Mask programmable means it will programmed at the time of manufacturing and will not programmed again, there is a derivative of 8051 micro controller, 89c51 micro controller which is re-programmable. This device also have Timer, Serial Port interface and Interrupt controlling you can use these according to your need.